When Jesse Perkins first flew the Inductrix® quadcopter, he knew that there was more to the experience yet to be unlocked. He mounted a small FPV camera and video transmitter, upgraded the motors, found a better battery and called it the Tiny Whoop™. Soon, thousands of Inductrix owners were flying in places they never thought possible! 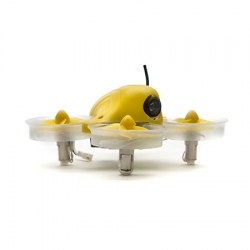 With the Inductrix FPV BNF, no soldering or 3D printing required! Enjoy a world you never knew existed when you are in the pilot's seat of the Inductrix FPV! The Inductrix® FPV from Blade® builds on the wildly popular platform and transforms it into an incredible FPV machine right out of the box. With its integrated 25mW video transmitter, FPV camera, high performance motors and large 200mAh battery, the Inductrix FPV is capable of flying in the smallest of places with ease. Enjoy the view as SAFE® technology makes flying simple and while the ducted propeller design allows you to bounce of walls and objects without crashing! The Inductrix FPV is equipped with a 25mW video transmitter capable of transmitter on Fat Shark channels 1 through 8 and all Raceband channels so you can race several pilots at once. You can select channels from the easy to use button atop the body of the Inductrix. The camera is very lightweight and perfectly protected in the body housing. The antenna we’ve chosen for video transmission is a dipole and designed with durability in mind. Video range of the Inductrix FPV is nearly 100 yards line of sight and more than adequate to fly in any large building or home.